Dirt is everywhere. No matter how careful you and your employees are, people track dirt all through your building, and those lovely floors you want to shine soon lose their luster. Who wants to look at a dull, dirty floor? No one. 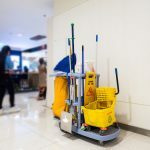 With a high-quality janitorial service, you have the hope of getting your floors as clean as possible, so that your customers and vendors walk into an office complex that sparkles. We have a tool in our arsenal to help us get your floors sparkling. Keep reading to find out about our professional equipment for our floor and carpet cleaning service—the B10 Rider Burnisher. In the past, businesses who wanted super-clean floors had buffers to buff their floors until they shined. While those buffers were great for their time, there is new technology available that makes office floors diamond-shiny. The new technology, called burnishers, polish the floors of an office to a near-mirror shine because the burnisher operates at far higher speeds, which means the floor is polished more deeply and quickly than with a buffer. Sometimes, floor cleaning services will be buff a floor first, and then burnish it, so that you get the highest amount of shine possible. The Tennant B10 Rider Burnisher is a truly unique piece of equipment. While in the past, floor polishers were operated by hand, which took hours to finish. The B10, however, is a machine employees can ride. This saves a lot of time when we are burnishing a floor. We can polish your floor to a brilliant shine without sacrificing time. Another advantage of the B10 is that it is very sanitary. Other burnishers kick up dust, which is then reworked into the floor, and that decreases floor luster. However, that is not the case with the B10. First, the B10 has HEPA filters to pick up the dust and carry it away from your newly sparkling floors. The HEPA filter is made specifically to trap dust, dirt, and the filter and off your floor. In your business, time is money. You want to get the most done in as little time as possible, because how fast and how well you do a job impacts your bottom line. Our commercial janitorial service operates the same way. We want to get your business as clean as possible as quickly as possible—which helps you and us. The B10 burnisher is 20% faster than any other burnisher on the market because it has more horsepower than any other burnisher out there does. In addition, the burnisher has a floating head, which means it burnishes your floor evenly the first time. While other floor cleaning services might have to go over your floors repeatedly to get them clean and shiny, we do not. The B10 Burnisher is battery operated with a long-life battery. This cuts down on the need for our machine to be plugged into an outlet, which saves you electricity, and prevents people tripping over cords. This machine can cover the largest floors without needing a recharge, or needing to be near an electrical outlet. While old buffers and burnishers without electricity ran on propane, which is dangerous, the B10 does not. 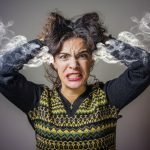 Propane fumes have been proven to be dangerous in an office environment, especially when the buildings are well insulated. Many people are allergic to propane fumes as well. Since our job is to offer top of the line cleaning with a nod to the environment, the B10 allows us to be as environmentally friendly as possible. The battery is top-of-the-line, with regard to the environment. It was made with safety and environmental concerns in mind. 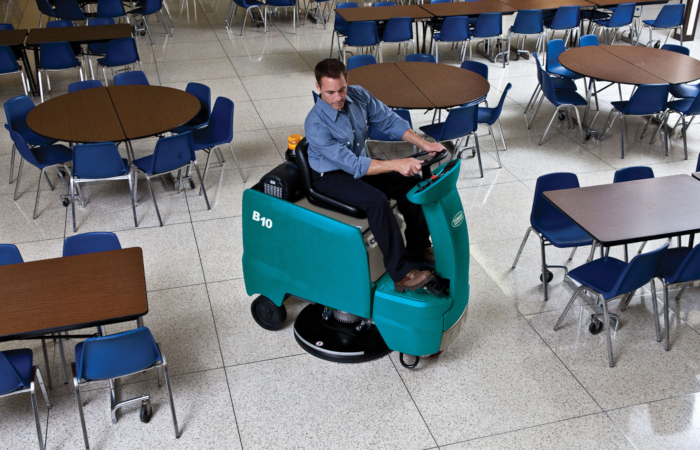 Because the B10 runs on batteries, it is much quieter than a typical machine, which means that we can burnish your floors without creating havoc in your office. The B10 is also smaller, lighter, with a tighter turning radius than other machines on the market. This gives our janitorial operators the opportunity to use the machine with ease, giving you the cleanest floors possible. There are very few floors in businesses without furniture, which means the job of a high quality cleaning service is to make sure the whole floor is clean. The tight turning radius enables the machine to clean your floor and turn in tight spaces. Ready to have a look at the B10 Burnisher, one of the professional machines in our arsenal of cleaning tools? We are dying for you to have a look at it as well, because it is truly state of the art. We would love to hear from you. Call 1(888) Team-INX today!